In my previous visits to Madrid, I have always had this impression that this city had such a deep and long-standing history with food. In fact, many of the well known restaurants in Madrid (such as Lhardy, Casa Botin & La Bola) have been around for over a hundred years. It feels like you are stepping back in time when you have a meal as the owners have made every effort to preserve the atmosphere of these restaurants as they were generations ago. In such a city that is in love with preserving the old, and its traditions, particularly in food – is there a place for the new as well? One big “Claro que si!” I’d say. Think Ferran Adria, Juan Mari Arzak and Paco Torreblanca to name a few. And then of course, in Madrid one only needs to look no further than restaurants such as Sergi Arola’s Gastro to see how the Madrid cuisine scene is evolving. Sergi Arola worked with Ferran Adria for eight years at El Bulli before moving to Madrid and heading La Broche (he is no longer connected there) and garnering two Michelin stars under his guidance. In 2008 he opened Sergi Arola Gastro in Madrid which has also attained two Michelin stars. And did I mention that he was a former rock star? In fact, he started working in a restaurant so that he could pay for a guitar! 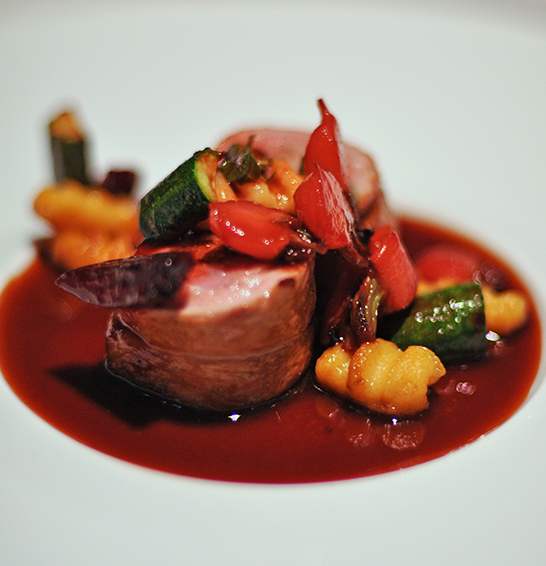 My hands down favourite dining experience in Madrid was at 2 Michelin starred restaurant, Sergi Arola’s Gastro. His cuisine was definitely cutting edge but at the same time managed to stay respectful to traditional Spanish cuisine. Take for example Sergi’s rendition of the Tortilla Espanola (first picture above), an egg yolk sandwiched between two crisp potato chips and underneath this morsel, a little bit of onion confit jam. Or one of Sergi’s most famous dishes, his patatas bravas. Confit potatoes topped with a spicy tomato and garlic sauce (alioli). They served this along with a very generous portion of banana chips, croquetas, olives and a vegetarian pizza as an amuse bouche. The dishes at Gastro are inventive, and fun and he isn’t afraid to use ingredients such as mochi for the turbot with baby octopus or borrow techniques from other great chefs. 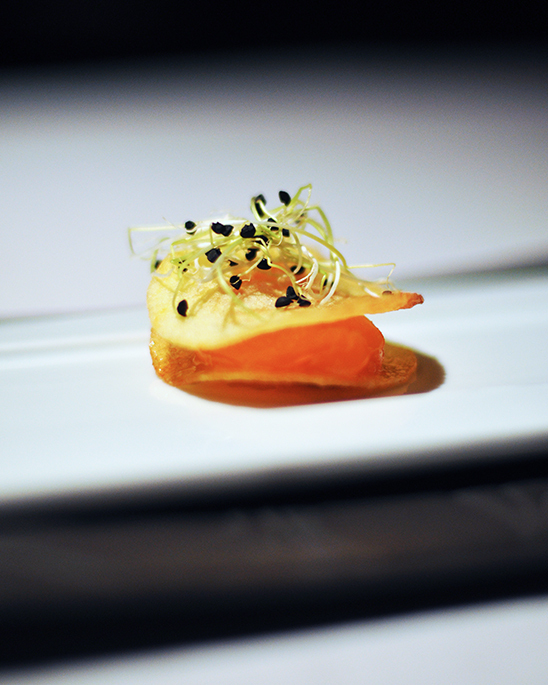 From my conversation with Sara Fort, Sergi’s wife, I found out that one of the restaurant’s dishes was inspired by Tetsuya when they cooked together for a function in Switzerland. The service, was fantastic as well. All the waitstaff is fluent in English and attentive without being intrusive. I had the pleasure of meeting Sara, the restaurant manager and Sergi’s wife who took us on a tour around the kitchen, the wine cellar, private dining room and bar and at the end of the night gave me one of Sergi’s cookbooks called Cooking is Fun! 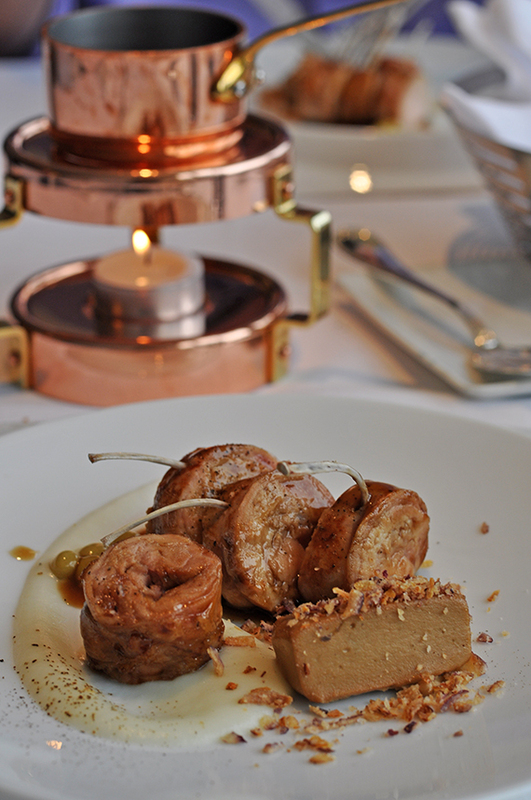 There are several degustation menus to choose from at Gastro. You can go all out and get the “Gastro” menu which has 14 dishes and costs EUR 160 (without wine) or go for the Basics menu which costs EUR 105 where you are able to choose several courses from the Gastro menu. 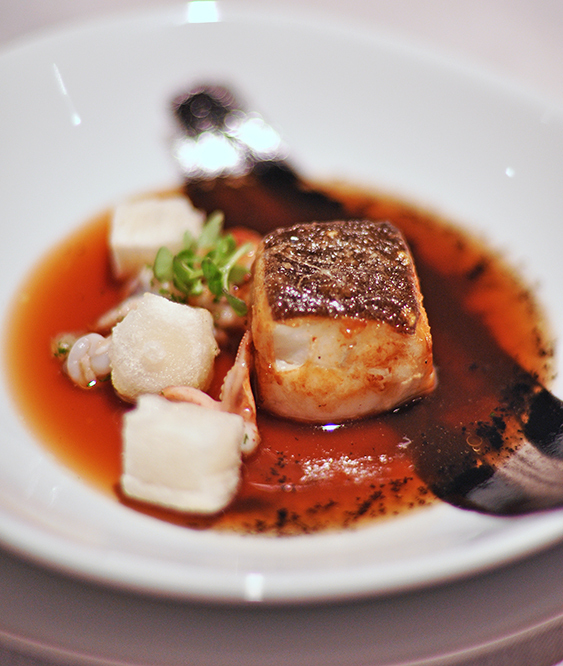 Coming a close second was La Broche Restaurant which has one Michelin star under its belt. 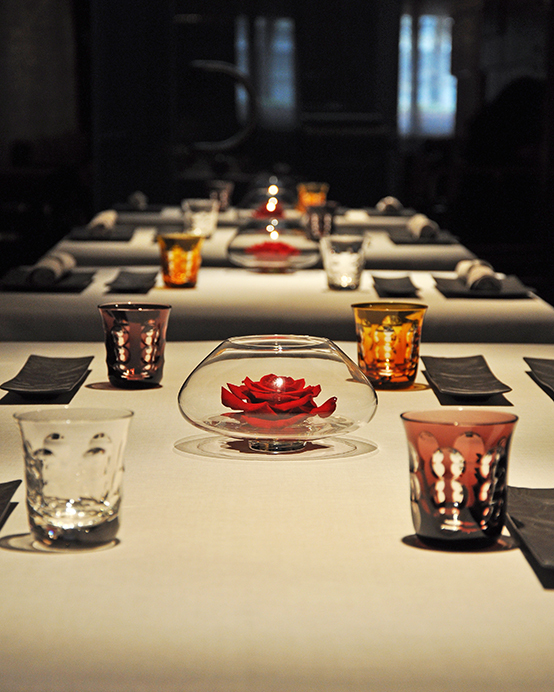 The restaurant is run by Angel Palacios, a native of Barcelona who also worked with Ferran Adria. At La Broche the menu ranges from a la carte to various degustation type menus. The splurge would be the Grand Festival menu consisting of 16 dishes and costs EUR 100 (without wine and does not include bread or drinks). 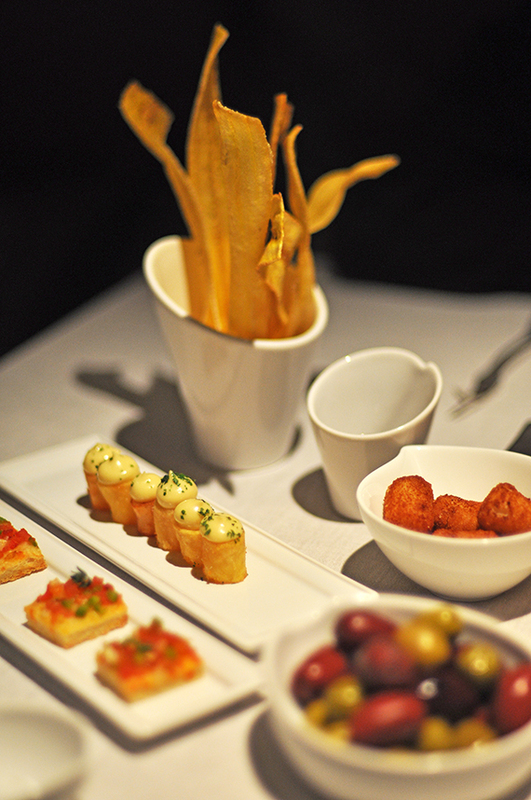 The Grand Festival menu starts with a selection of tapas, the moves on to entrees, fish, meats and finally desserts. However, there are also other options like the regular degustation which costs EUR 70 and consists of 2 tapas, 2 entrees, half a fish course, half a meat course and 2 desserts. The highlight dishes for us were the Bacalao with peas and consomme as well as the rabbit with an onion sauce. And at the end of the meal, I felt like a child in a candy store because, as you order coffee (or tea), the waiter rolls out a whole candy cart and asks you whether you would like anything from the selection. You can choose a few like the pate de fruit, or the almost with stracciatella or you can be like me and ask for a little bit of everything! I had a great time in Madrid and am thankful I was able to go back to my old haunts but at the same time experience the cooking of chefs who are changing the face of Spanish cuisine. Both will continue to thrive together because, very good food is always just that – very good food! I am so delayed in reacting to this post but it made me miss Spanish food big time! OMG, I’m totally drooling over these marvellous food! Luckily, I’m wearing a napkin before entering here! haha….. I’m sure you had a wonderful trip! what an amazing collection of photographs: I so wish I could have tasted a few of those dishes! Just one right now would make my day!! It’s been ages since I’ve been to Madrid, and it was long before the new food revolution took hold there. Am dying to go back to experience it all. Thanks for letting me live — and taste — vicariously through your pics and descriptions. Oh my god Trissa, you lucky duck! These look absolutely amazing! I really felt like I was trailing behind you… great reporting and the food is so majestically presented…little works of art! I have not been to Spain but reading your post makes me want to jump on the next plane. You had a wonderful time and welcome back! Trissa everything is fabulous, but I especially love the candy cart. Trissa, your photographs are lovely! The food looks divine and perfectly plated! I wish I could be right there in your pocket while you have all these wonderful dining experiences! You are certainly enjoying your time in fabulous Spain!! Lucky you! The pictures are truly entertaining & the food just looks fabulous!! Gorgeous photos! What a wonderful time you’re having. This food looks amazing. I can’t even begin to tell you how hungry I am now! and a candy cart! just adorable. Wow.. the food looks fabulous. I’m putting it on my list of restaurant to try next time i’m in Madrid. O wow girl; you seem to be having such a wonderful time in Spain! Can you believe that I have never been to Madrid?? We’re looking at some place to go to end of the year so I am very tempted to pick Madrid after reading all your stories and seeing those gorgeous photos! Ohh..I wish I was there with you!! Everything looks outrageously mouth watering and beautiful and your photos are just spectacular. Hope you continue to have an amazing time on such an amazing trip! 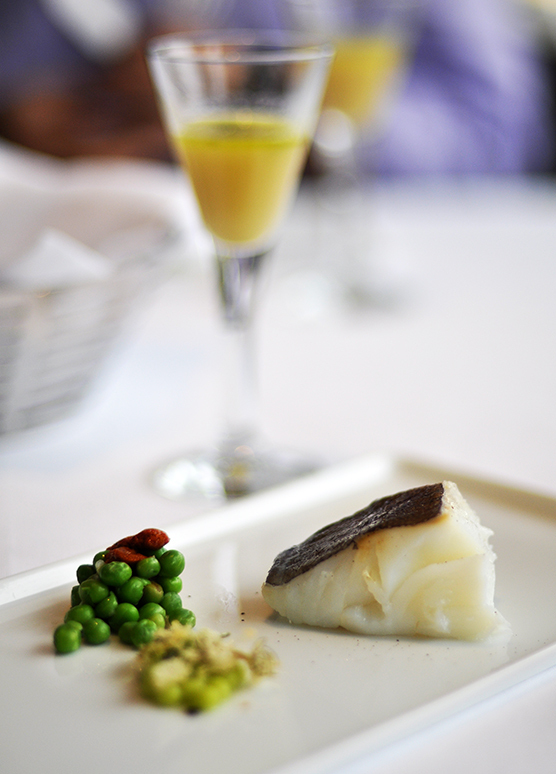 Every dish looks beautiful in its presentation and looks delicious too. Heard a lot about Spain. Hope to visit it soon. Your photos are great Trissa. That candy cart is amazing. I am going to have to make my way to Madrid! I love learning about the experience and innovative styles of these chefs and the pictures are fantastic! wow. the ingredients, presentation and ambiance all look perfect. your photos are lovely! p.s. the high tea post is up! 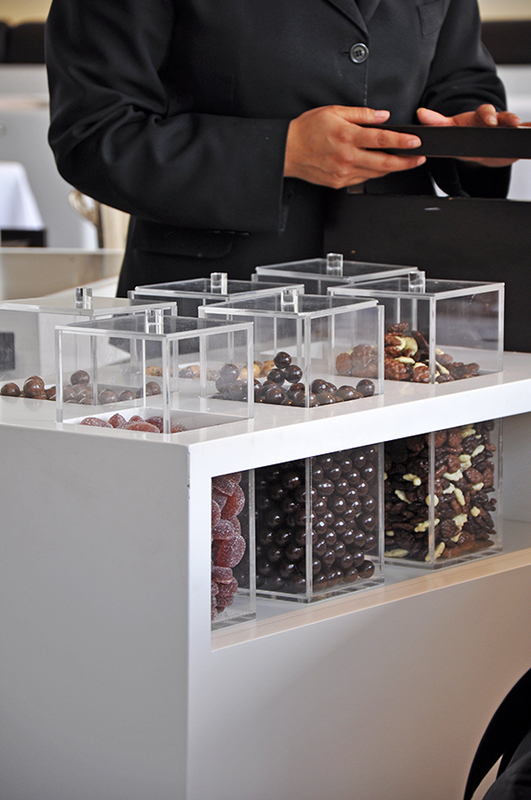 The candy cart is such a fantastic idea! A lot of nice looking dishes. A lot of expensive looking ones too. I can see why you loved the rabbit- visually it even makes me all beady eyed. The little shovel for the salt- awesome! Gosh, I’d end up broke if I were here!! So exotic and out of this world to me! Wonderful..Many thanks. the dishes are so amazing and plated so precisely. what an experience! I was mesmerised by the rabbit with onion sauce dish, but then the candy cart stole all my attention 🙂 I need one of these at home! You have just sealed my fate. I am saving to head to Spain. Friends have been raving about Barcelona and now, madrid. Every dish was so beautiful. Wish I could taste any one of them. Oh, it can only be in my dreams, lol. This is some glorious looking food. I hope you had fun eating. Absolutely gorgeous Trissa…you’ve really captured the new Madrid beautifully! Everything looks so exquisite and too good to eat! Thank you for sharing this gastronomic journey with us. your photos are fantastic trissa and oh my a candy cart oh how awesome! Great photos. How I wish I’m there with you right now tasting all the food. Spain is another place to visit. I remember seeing Sergi Arola at the World Chef Showcase and he showed us how to make the potato dish (with recipe) although I’m sure my attempt won’t be any good! My eyes and stomach made a beeline for the candy cart! Oh my gosh, I was excited by the tortilla espanola (the magic of that egg yolk!) and then I cooed over the rabbit lollipops but ahh the candy cart! Claps of childish glee. Very impressed by the copper pot with burner too, and the amuse bouche and the little shovel in the salt bowl and oh ok everything looks incredible – I’m not surprised this ended up being your favourite dining experience! Dear Trissa – What a treat! 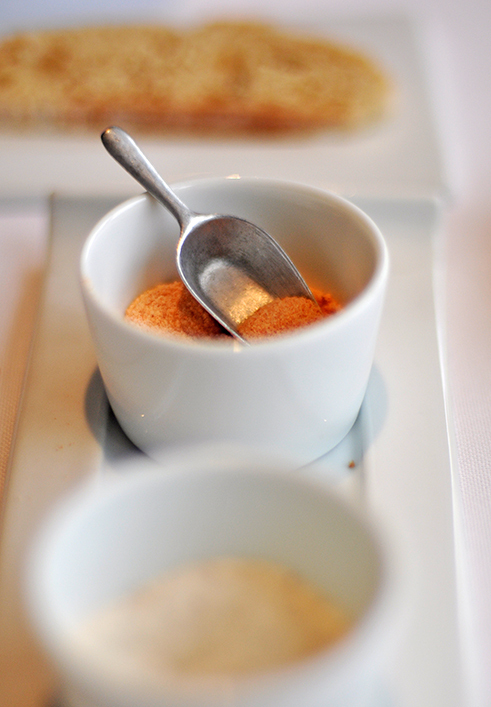 Until I can do this in person thank you for taking me on a gastronomique tour of Madrid…Sergi Arola Gastro, WOW! what ambience and what food! Lovely pictures…what a treat! Spain is definitely in my bucket list.